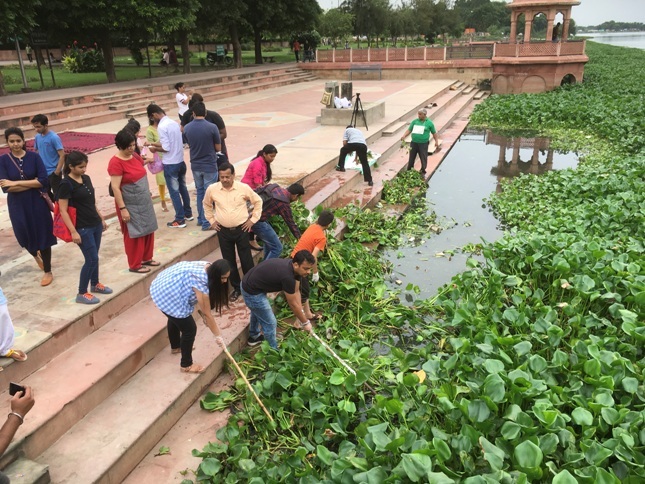 On August 13th in Lucknow, the capital city of Uttar Pradesh, India, a group of over 30 volunteers and several civil society organizations joined forces to save the Gomti River by founding the My River, My Pride river cleanup campaign. 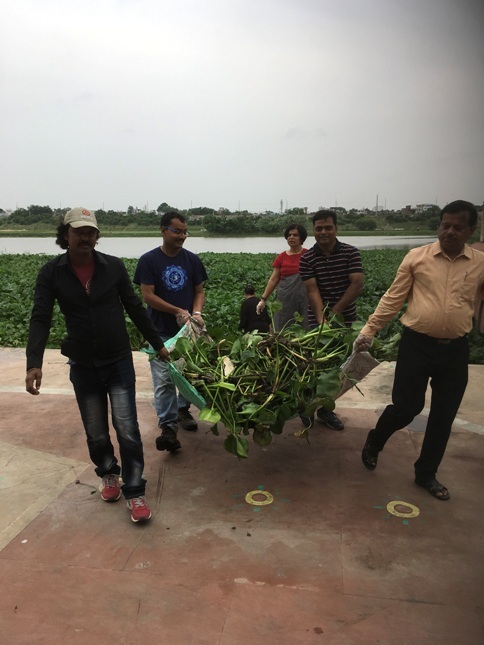 Having been robbed of its health by dams, invasive species, and trash, the Gomti needs help from this group of environmental stewards as much as they need the river, an important water supply source to the citizens of Lucknow. On this day in August, Venkatesh Dutta — river scientist and Gomti River Waterkeeper — conducted a workshop at Kudia Ghat, an ancient and sacred place in the city, to brief the volunteers on the importance of the river, its contribution to the citizens of Lucknow and some of the issues it faces. Several more flow obstructions along the Gomti are contributing to the drop in river health. For example, Subh Sanskar Samiti installed a Murti Bank at the Ghat for the disposal of idols, which are otherwise immersed in the river. Blockages such as these must be better considered by city planners before being put in place. 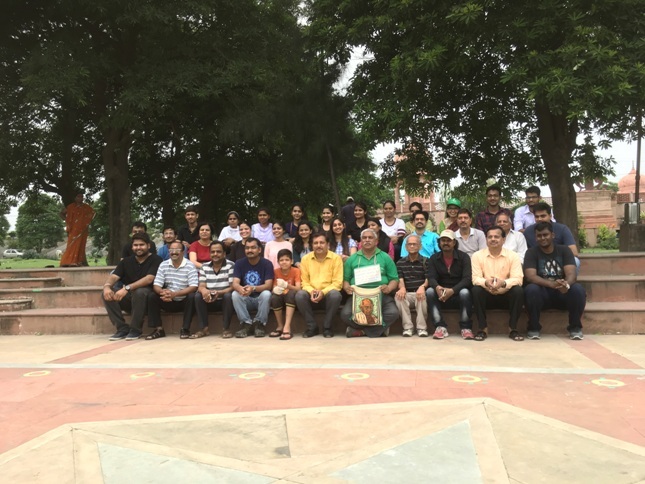 Students from Jaipuria School of Management, volunteers from Syamsiddha, Lokbharti and Subh Sanskar Samiti joined the campaign to help return the Gomti River to its pristine state at this important Ghat — the flight of stairs leading down to the river. The first cleanup for the My River, My Pridecampaign is planned for August 22. The group has decided weekly cleanups will be effective in reviving the Gomti and surrounding environment to its prior impressive state. Riddhi Gaur of Subh Sanskar Samiti says that frequent cleanups are important because several people bathe there daily, adding to the green mat of water hyacinth that is choking the river. Samiti lists disassembling the earthen dam and removing debris from riverfront development as issues that should be prioritized by the concerned authorities. My River, My Pride plans to attract volunteers from all over Lucknow. Krishnanand Rai of Lokbharti wants the campaign to go as far as calling on “all colleges and universities in Lucknow to motivate their students to participate in the weekly cleanup drive.” Aditya, a volunteer and local resident, said, “I have come here for the first time, even though I am a resident of Lucknow. The cleanup efforts have lifted my spirit. It is really sad to see such pristine areas getting spoiled by our sheer negligence.” The initial meeting has instilled hope in many and will continue as the campaign grows.